"Populäre Mechanik is an improvisational group from Berlin playing a unique amalgam of Fluxus-inspired garage rock, free jazz, and live electronics. It was originally founded in the early 1980s by Wolfgang Seidel who had previously been the original drummer for West-Berlin leftist rock band Ton Steine Scherben and after that became a long-time collaborator of Conrad Schnitzler with whom he played in Kluster and Eruption, as well as in duo recordings. Recently, Seidel emerged as an author and has published a number of writings on the history of free rock and experimental music in Western Germany – especially Krautrock –, most notably the book "Wir müssen hier raus" (Ventil Verlag, 2016) that is still awaiting its English translation. 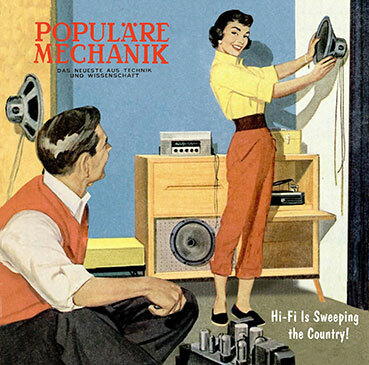 The music of Populäre Mechanik is rooted in equal parts in the pop music socialization of its members and the desire to experiment and incorporate cues from free improvisation and avant-garde music, while retaining a sense of enjoyment and playfulness, avoiding all pitfalls that are often present in rock-based progressive music. The name of the band is a nod to the 1950s and 1960s era of US science and technology magazine Popular Mechanics and was chosen as a statement of positive affirmation of the modern age, against the dystopias offered by much of Punk and Industrial music at that time. The first incarnation of Populäre Mechanik released a 7" single and two cassettes, parts of which have recently been compiled on a CD/LP on Bureau B. It broke up during the 1980s. In 2005, Seidel revived the name for a new line-up – himself being the only common member – that played in a similar vein. This second incarnation of Populäre Mechanik can be heard for the first time on this double LP. The line-up features improvised vocals by Alex Bulgrin, who otherwise performs as a garage rock singer with Berlin's 60s music collective Beatorganization, as well as Sven Hanke (table git, synth), Marcus Jaeger (git), Lars Jeschke (piano, keyboards), Kolja Nixdorf (trumpet), Matthias Sareika (bass, synth), and Wolfgang Seidel (perc, synth). All recordings were made between 2005 and 2014 in Populäre Mechanik's rehearsal room. Full-color gate-fold sleeve with photos and extensive liner notes by Seidel explaining the history and musical positions of the group. Edition of 300.